I have been trying to get my hands on The Meaning of Maggie for ages, so when it arrived at our school library, I begged the librarian to let me have it before she could even process it. When I first started reading, I wondered what I was in for. 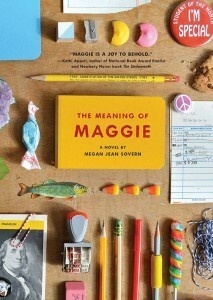 Maggie has a very strong voice - self-confident, boastful, intelligent, and naive. The sentences are long and can be convoluted. But once I got to the heart of the story, I was hooked, and ended up crying as I read the end. Maggie has two older sisters and cool parents. Her life has shifted a bit since her father's legs and arms have gotten "sleepy" and her mother has gone to work in a hotel. Maggie is kept in the dark about what's really happening with her father: multiple sclerosis. It was strange to me that such a smart kid wouldn't have more questions about her father's deterioration, but I suppose it is natural if this is the way he's been her entire life. When she finally realizes the gravity of her situation, she decides to fix him. I fell in love with this family and the way they joked around, in spite of everything. For example, when the father falls out of his wheelchair, he says he is just warming up for a game of Twister. I don't know of many books with a character with MS, so I think this will be beneficial for kids who live this reality. For the rest of us, it's a touching coming of age story.